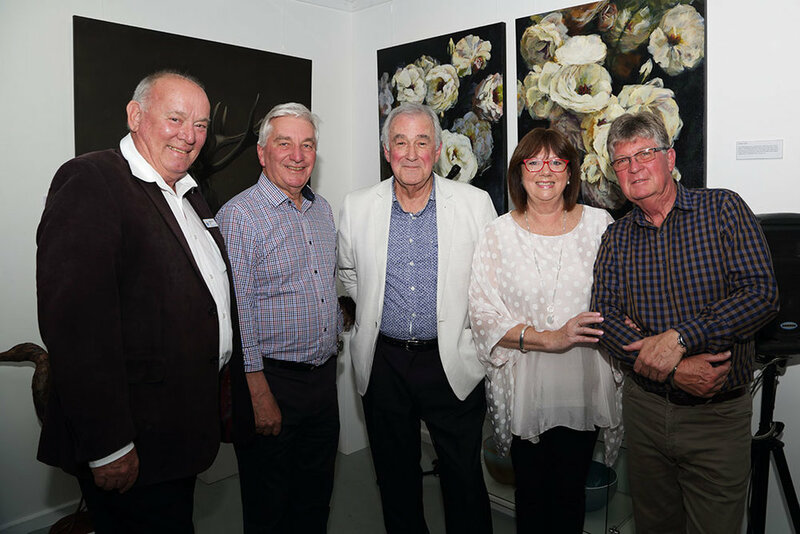 If you've been involved in the art world for a while you will know that as far as paintings go, the biggest selling items are those bought to match home or office decor. If it's not true in other countries, it's certainly the case in Australia. Within the ranks of artists, the term lost and found edges is quite a cliche - we hear it a lot. However, when it comes to actually painting it can be forgotten, right along with other things we thought we had learnt along the way. It's easy to forget when we are busy at the easel! Artists are some of the greatest observers of the world that you can find. We tend to look at things a lot and analyse them in terms of colour, shapes and tones. With more and more people taking up art, particularly in their later years, it has produced it own little economy. In many respects it is good for artists. Never before have art materials been so accessible and affordable. Learning painting is also not a problem, as the mysteries of the skill are taught and outlined in the myriad of online tutorials, art classes and workshops.. It's something most of us have said or at least thought when we see some pieces of art - particularly if it's got a high price ticket. What is often not recognised in the strange world of art pricing, is that the price is often bound up in who the artist is and not the art itself. The more well-known the artist is, the more likely they are to attract higher prices for their work. After reading a rather baffling artist's statement the other day I thought it was worth a few words. It is now common for galleries and art prizes to request artists come up with a statement about themselves and their work. This is in addition to any achievements they have gained over the years. The artist's statement is important. I noted online recently an artist starting off painting demo with a palette full of colours. There were 21 colours in all – a formidable array for painting a landscape and the finished product told the story. The landscape in question turned out to be quite detailed but the overall colour scheme was jarring. The overloaded palette was the downfall of an otherwise competent work. It has been said that inspiration is the luxury of the amateur and in a sense, this is true. A professional artist can't wait for some inspirational moment before they can paint - poverty will be the result. In fact the need for food and shelter is inspiration enough for those who live by the brush! In some respects taking up painting is like learning to drive. Gear changing, clutches, brakes, mirrors, accelerators and coping with live traffic are familiar memories of our first days in a car. All we could think about was the actual procedure of driving, with hands firmly gripping the steering wheel. If you are a botanical artist or photo-realist, then detail is crucial. If we are not one of these two types of artists, and paint in a representative way, detail can be one of our biggest traps. Usually, the trap is set to spring as we get closer to finishing a painting. When we start a work, the concern is about big shapes and tones, and often we can really like the result of this almost-relaxed stage. It can be surprisingly alluring, but we push on because it isn’t the vision we had at the beginning. As we get even closer to what we think is the finish, something happens. Even without thinking we start looking for extra detail to add. Actually, the detail in the reference uses a megaphone to alert us to the fact that we have omitted certain things that will render the painting a failure without them. I was caught out a few days ago while painting a pair of kats on a beach. Seeing that the canvas was biggish at 90x90cm, I had decided on a larger brush to do most of the work. The shadow and sunlit parts of the sails were the real focus of the painting – the broad sweeping brush seemed to work in getting the desired result. Everything was broad, but as the work came closer to a conclusion, I decided it was time for smaller brushes. As soon as I picked up the small brush, I was looking for small things to add – I had one foot in the trap! I picked up a delicate rigger and put in some rigging, after all, it was in the photo. This wasn’t so bad, but then I started painting the ribs in the sails with the same brush, yes, they were in the photo too. The problem was, that after all the broad brush in the beginning, it has set the tone of the painting. Being broad for most of the painting and then fiddling with a rigger just wasn’t working. A better option would have been to imply the detail with a large brush and leave some stuff out altogether. Issues like this needs constant attention, because when we don’t think about it, the default ‘let’s consult the photo for details’ – kicks in. It’s amazing how well detail can be implied with a large brush, and all it takes is a bit of practice and being aware of falling in to the detail trap. Being broad is not every artists cup of tea, but chronic attention to detail is there to trap any of us at any time! The ribs in the sails were initially put in with a smaller rigger (as in photo) but just didn't look right. I ended up implying them with a larger brush and it was kinder to the overall look. If there is one thing that landscape artists should learn, it is painting the illusion of distance. I say illusion because that is just what it is, after all, it’s just paint! One of the biggest problems facing artists that paint from photos is that photos rarely depict real life distance. I have seen this problem often in paintings where distant objects are the same or similar tones to things that are in the foreground. All that drawing and detailed painting can be perfect but if there are no tones that depict distance, then the painting is flat and lacking. I know it is a quite punishing statement, but the solutions are simple enough if we are interested. First and foremost, we have to unshackle our thinking from the grip of the photograph. The photograph demands out attention and silently insists on us copying it even when doing so is not going to produce a good painting. The power of the reference photo is so strong that if we stray from it we actually think we have failed and conversely if we end up with a painting that looks exactly like the photo we think it is successful. Of course, both things are wrong. Success is more likely when we just regard the reference as a guide. It is one thing to read it but quite another to actually implement this thinking. It takes conscious thought from the beginning of the painting till the end. Next, is real life observation. Getting out and looking at the effects of distance on colour and tone is crucial. Every time you step out of the house you should be looking for it. The more you see it and understand it the better your paintings are going to become. There is nothing like Plein Air painting in getting our brains to switch on to the colours and tones of distance. The blur of distance is largely lost in photographs - particularly snapshots in which the focus is on everything. In real life, when we look at one thing, the rest becomes out of focus. We should paint similarly to this too if we want to produce works that have depth. Getting into the habit of even slightly blurring distant objects will have us on the way to producing paintings with great depth. Add to this a little bluing off as things get further away and we will be using something called atmospheric or aerial perspective. It's where everything is turning into the colour of the sky the further away it is - even mountain ranges do! Two Yachts - this was painted in acrylic plein air at Seacliff. I have blurred the background detail as well as toning down the colours. Note that the touches of red in the distance are not as intense as those close up. Also the blurring of the background has allowed the yachts and sailors to have prominence. Among the many paintings being produced today, an increasing proportion of them are meant to confront the viewer in some way. It may be controversial subject matter designed to jolt an opinion. It could be an image of the darker side of society or human life or maybe disfigurement of an otherwise pleasant thing for no other reason than to disturb us. There are other disquieting paintings that have no shock-value in their subject matter but they have random and jarring colour use and confusing patterns. I have seen many such things in print and on TV that not only clash with everything else in the room, but more importantly they generate visual discord and may I suggest, even mental discord. In a world that is so full of ugliness it seems we can't get enough of it and such art appears frequently especially in public buildings and institutions. Publicly funded art is hardly ever calming or understandable. There is a lot to be said for paintings that produce calm, simply because they have power to do just that. 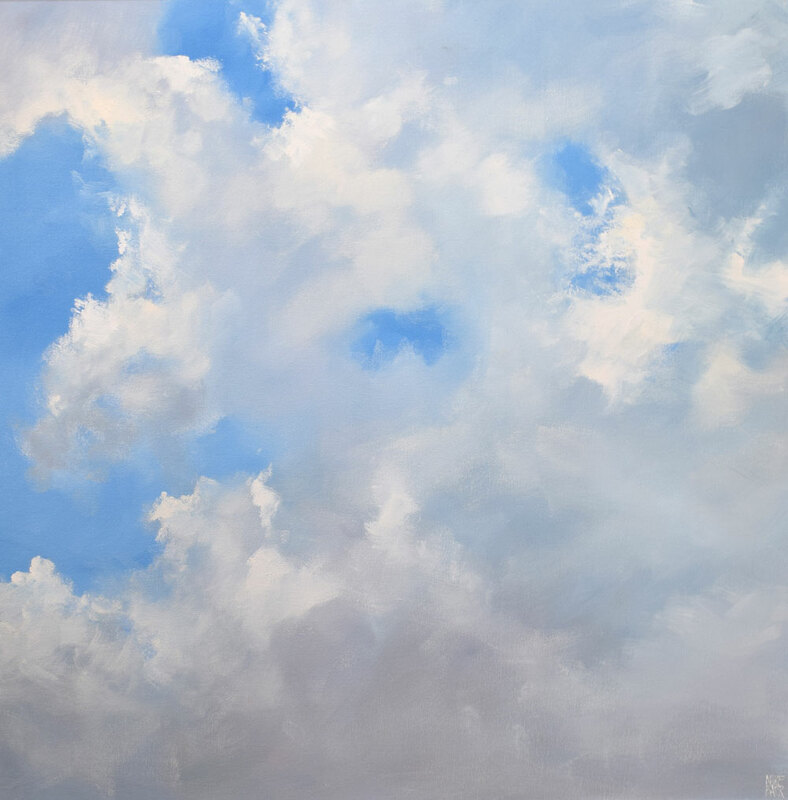 I once painted just a sky with clouds and a lawyer bought it for his office and told me it was for the times of stress when he could just turn his chair and look into the serenity of the clouds. It showed me that there is power in painted calmness particularly when people crave it amongst their daily troubles. The calming influence of such paintings not only reaches out into the homes and offices in which they hang but they also have an effect on the artist too. We cannot be untouched by the things we paint because they come from the heart. Angry, ugly and unfathomable art may draw praise from the art world, but it really helps no one else. Artist statements may attempt to legitimise their visual chaos, but often descend into coded artists’ speak that is so outrageous, that it is pure comedy. The world needs calming and I think it is within the power of artists to spread calmness, beauty and awe through their works. It's a worthy cause rather than adding to society's dark side. My Clouds - acrylic on canvas - 90x90cm. If you look at the painting long enough you can see the clouds move. Artists can worry unduly about having a studio, and while it is a lovely thing to have, a palatial studio does not always equate to grand work. I have only recently acquired a studio - a granny flat that has been occupied by quite a list of family inhabitants but now dedicated to paintings and storage of such. Storage really is the big thing! Before this it was done on the front or back porch, the shed or dining room. My best award-winning painting was produced on the front porch on a hot windy day. I'd already had a painting marred by it blowing off the easel and was aware of the conditions while I painted the next one. I was engrossed in the process when my neighbour decided to take a look and I didn't see him coming until his head appeared from behind the canvas. His quiet "hello" had me jumping out of my skin - I'm sure it nearly killed me! It made me think though, that the small distance between artist and canvas is holy ground. This applies to working in a spacious studio or on the porch, this connection between the artist, the palette and the work is intense and private - it becomes a kind of sanctuary. The very mention of the word studio though, somehow conveys the idea of a public place of worship. Some just want to drop in, hang around, chat and be a co-inhabitant for an afternoon or two. The artist's workspace, wherever it happens to be, is best utilised when there are no distractions. The process involves the whole person - body, mind and spirit. A disruption to any part of this will be a loss to the artist and the work. Background noise that is unavoidable can be blocked out, but another person demanding friendly attention will spoil the circle of creativity. Many of us have to set up our equipment every time we want to paint. I know how arduous this can be, but at the same time, the setting up is preparing our minds for that which is to come and painting time is even more precious. Of course, there is a lot to be said for a space that we can just walk into and start painting. But in the end it's the magic that takes place mentally and physically in and around your easel that counts. While we might dream enviously about some of the pristine large studios we see, it's worth considering that some of the best works have been produced in less than ideal surroundings. Caption: Ten years ago I painted in the shed at the back of the garden for a while. There was barely enough room for storage but the little space between easel, artist and palette was all that counted. Whilst looking at Turner's Snow Storm painting the other day, it struck me that there is one thing that sets up the whole work. The painting is wildly dramatic with its swirling snow storm and heaving sea, but the one object that makes it really work, is that little mast on board the steam ship. The slender pole is slightly bent in the gale, and of course, the flag is outstretched to its limit. In the overall painting, the mast is a small object, but really it is the star attraction that draws us into the painting's drama! Not only is our eye magnetised by it within that seemingly small visual break among the clouds and waves, but it also indicates the ferocity of the conditions. This painting by Turner contains secrets for every artist. Drama - not every scene we wish to paint has built-in interest and drama, but I believe we should think about putting both elements in the paintings we produce – whatever the subject. Just one thing can transform a work from being okay to outstanding, and in some instances, just one or two brushstrokes can do it. Interest - interesting subjects don't always make interesting paintings, and often it can be as simple as there being too many things to look at. Recently, I came across a painting of New York City and every single window in every single building was carefully painted in, including the Empire State. It was a monument to the patience of the artist, but it said nothing about the city. The drama of this amazing city was lost in the attention to detail. Having detail in the whole painting will have us observing the detail, but it can block us from entering into it. It is better that viewers become participants rather than just observers. In Turner's painting we are visually dragged into that point of interest on the boat, with the swirling blurry storm helping us in, without halting our little journey. It really is a masterpiece. Like Turner's bending ship's mast, it’s worth our time to figure out what will change a painting for the better. It could be an addition, a subtraction, a splash of colour, or light, deeper darks, or simplification. Don't be confined to painting what you see – paint for added interest. Paint the drama of life, whatever it is. Caption: Turner’s Snow Storm: Steam-Boat off a Harbour's Mouth – oil on canvas 91x122cm. With this work who could deny that Turner was the father of impressionism. Portraiture, unlike most other painting genres, is very unforgiving! During our combined painting demonstrations every year, dear friend and portrait artist Gerhard Ritter reminds us that compared to landscape artists, portrait artists have it tough. Some friendly banter usually ensues at this stage, but of course it's true! There are different styles of portraiture from broad impressionism to realism, but if they don't represent the likeness of the sitter, then they have failed. It's a tough world in which almost catching a likeness just doesn't cut it. There aren't many casual portrait artists that are good at it. The stand-outs tend to be passionate about it all, and I would go far as to say, it's more of a vocation than any other painting genre. They are expert observers of the human face - they never stop looking at faces and they wish they could stop every interesting one they see on their daily travels. They see human faces in portrait format without even thinking about it, and they sense deep loss when a fleeting potential masterpiece of a face passes them by, but they also triumph in finding the most interesting faces and characters. Oils are the preferred medium for portraits, but amazingly some artist are successful in watercolour, acrylic and pastel. Almost all of the processes that these artists use have a degree of mystery about them, and often, the likeness appears in the very last part of the painting. A likeness that is obtained too early can be hard to get back. Portraiture is an old tradition and I remember seeing my first Rembrandt at the Walker Gallery in Liverpool as a young teenager. I can still feel the impact of those dark backgrounds contrasted with the light and shadows of the faces. He was a true master. There are many portrait masters living today, but compared to the millions in the world that claim to be artists, there are but a few. Thankfully, good portrait painting doesn't mean it has to be photographic or perfect. However, it does need two things at least. First, and importantly, is the likeness, then there is character. Every portrait artist talks about capturing the character of the sitter. Recently, during a portrait event three artists revealed their works of the same sitter. Each of them spoke about the importance of capturing the essence of the person being painted. All three paintings were well done, but just one had a likeness of the physical and the character of the person. There is a spark in good portraiture that goes missing in the ordinary. It is a spark that painters of all persuasions and genres love to attain, but don't always achieve it. Portrait painting, like other painting, is not about photographic detail, it's about catching the essence of a person or place. If we can translate that into a painting we have everything! Caption: A quick, unsophisticated acrylic sketch of former President of the Royal South Australian Society of Arts, James Raggatt. I'm not a portrait artist, but was lucky with this one as it did capture James's likeness and infectious smile. December 2008. Many of us wish to paint looser and I think this is because looser paintings have more appeal to them. They look like they are painted with a brush, and a tight painting can look quite photographic. Loose paintings have movement, and to me they are the painting equivalent to a movie, as the eye moves along with the visible, bold brush strokes. In contrast a highly worked painting can be more of an achievement than a work of art. A thousand-hour canvas is certainly epic, but it doesn't make it a better painting than one which took a few hours in a loose style. There is a real interest in being able to paint in that looser style, but the question is, how is it possible? Firstly, the subject matter must be simplified in the imagination of the artist. We must be able to simplify it in our minds before we can in paint, whether it is from a photo or real life. Our natural instinct is to copy everything and painting looser requires that we leave out stuff, smudge, blur and leave in some edges and contrasts. It's a true education in art to paint this way, even if we only do it occasionally. Big brushes, especially in the early stages will help a lot. It's hard to be fiddly with a 2-inch brush! Actually, the size of the brush should be in proportion to the size of the canvas and a bit of experience should be the teacher here. The very last part of the painting might need a bit of small brush, but not much. If you have a million colours on your palette, you will be at a disadvantage. Concern about colour can tighten things up because we are thinking about the mechanics too much. Colour doesn’t make a painting, but feeling and movement certainly does and this often comes from tones rather than colour. The biggest contributor to successful loose paintings is confidence and there is no way around this. Painting is an acquired skill and skill is a product of repetitive practice. Confidence is the product of this practice - many hours of practice and learning from mistakes of our own and those of others. In a conversation with a fellow artist and teacher recently, we discussed how many artists wanted to paint looser, as if it is a thing you can just do. We agreed that actually that looser style comes largely from confidence. That untouched brush stroke that looks just right is probably the product of years of experience. Can you speed things up? I think you can and it's done by painting lots of pieces but with the initial intent of them not being finished works. This mindset will help you from being too careful, after all a practice piece is just that. You will find that a carefree practice painting might just present itself as one of your best! Caption: Sometimes those small quick brushy paintings just work. Almost as soon as we take-up painting we start hearing rumours about the colour green. The main two are that it’s difficult to use, and that green paintings are hard to sell. Firstly, the difficulty aspect of green is true. So few artists can handle green well, and despite that there are more green paintings that you can poke a tree at. Discovering good greens is a triumph for a painter, and mostly, they don’t come straight out of a tube. Many artists don’t have a tube-green on their palette, preferring to mix the greens from other colours. Other artists, like myself use a base green but always mix it with other colours. Veridian is a great traffic light green mixed with white, and used in conjunction with other colours like yellow ochre or Sienna it can produce wonderful muted greens. Mixed with cadmium yellow it can make vivid sunlit greens. Every artist has their own little favourites. Joe's painting at Camberwell combines the green with the greys of buildings behind them, and it is superb. Greens are on their best behaviour when they have a grey backdrop, and this is borne out on a grey stormy day when a sunlit tree is back-dropped by a grey brooding sky. For me it was the stand-out painting of the show. Notice the subtle greens within the shadows of the walls too. Well, Joe's did, and at 168x122cm it didn't come cheap. I think we can say that good green paintings sell! As far as greens go, Australia is the lucky country. We have all the greens seen in Europe but also the wonderful grey-blue and golden greens of the gums and other growth. Getting greens right is a journey that is well-worth undertaking, and it takes some experimenting - this is one of the joys of being a painter. One of the biggest hang-ups about painting is having to think too much about it, while we do it. Of course, we have to think about what we are doing, but it can easily overtake our artistic side and in the end, artistry can drown in theory. All said and done, no one is going to be a painter because they know all the theory. Skill grows from the continual process of painting itself. No one has ever learned to drive without actually driving. For example, colour theory isn't just learned from reference to colour charts and wheels, but by the use of colour on the palette and canvas. It is a personal journey that is different for everyone. Very early on I discovered by myself that red was toned down by green - actually, I didn't even know what tone was, but I knew that by adding a bit of green to bright red and some white, I could get the terra cotta colour I wanted. Referring to colour charts and wheels while we are actually painting, can halt the flow of our work and growth can be stunted. The fewer colours you use, the easier it is to comprehend the amazing reach of colour mixing, and you will learn more about the subject than swarming over a 100 charts. Composition rules can also be a needless worry. Recently, I read an artist's take on DaVinci's Last Supper painting. They drew red diagonal lines all over it, indicating the intricate compositional pattern. It looked impressive but made no sense at all, and is of no practical help to artists. Composition, like every other aspect of painting will develop in time. A sense of balance will become second-nature if we are continually aware of it, even when we are not painting. Painting Plein air is the greatest teacher because everything has to be done on the fly, such as colour, tone, composition, and perspective. It's the best learning process there is, because it demands that artists to take control by making their own decisions. Read the books, view the videos, and go to the workshops to learn as much as you can, but remember you'll only ever be a painter if you paint.